There’s a game that takes place in our house almost every afternoon at the moment and it is driving me mad. I have loosely termed it “Let’s Take Every Cushion off the Couch and then Grab Every Soft Furnishing We Can Find in the Rest of the House and Make Them into a Fort on the Floor”. Catchy name, hey? 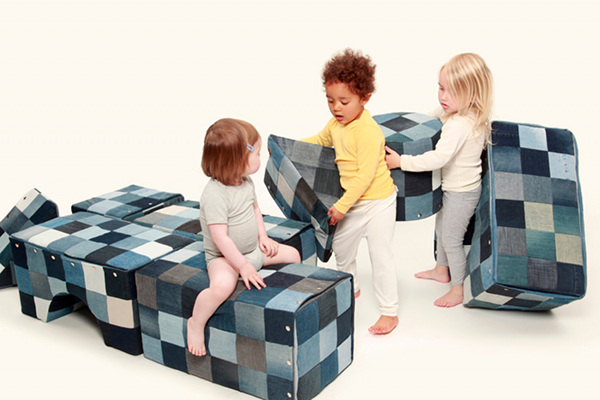 The simple fact is children love climbing on, piling up and diving off lounges and cushions. Now a Dutch company has taken hold of that idea and turned it into a sustainable, educational and eco-friendly toy. The company is BluBloxx and this, their first product, is also called BluBloxx. It is a five piece, interlocking set of oversized foam blocks especially designed to let little imaginations run wild. The company’s impressive mission is to make educational and sustainable toys, with minimum energy expenditure and using recycled materials wherever possible. 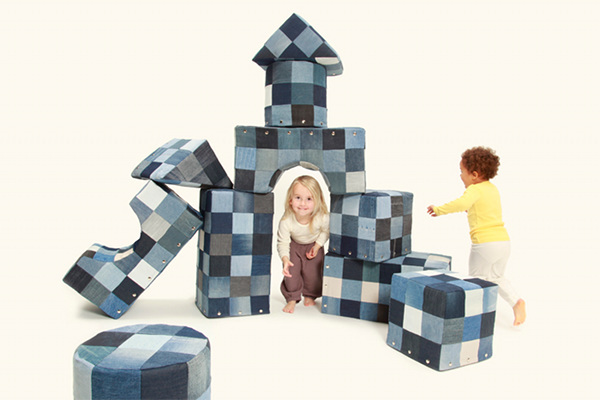 The BluBloxx Set is covered in handmade patchwork fabric entirely constructed from old denim jeans. Not just friendly to the larger environment, they’re also pretty friendly in your home environment – each cover is easily removed and machine washable. No pricing details are available yet – at the time of writing they are still getting their online shop off the ground. Why not head over and have a look? You might just save your lounge in the process.